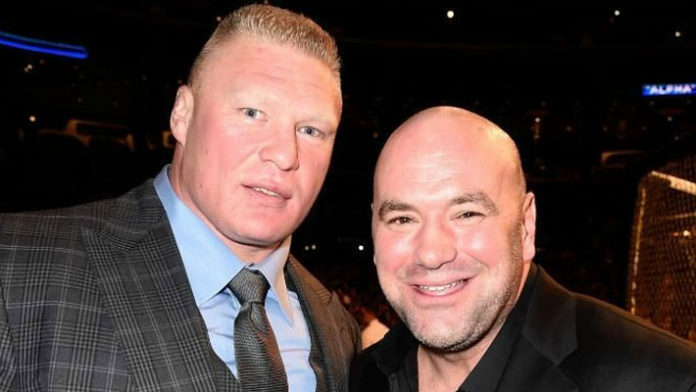 UFC President Dana White provides a Brock Lesnar update and when fight fans can expect to see "The Beast" back in the Octagon. Current WWE Universal Champion Brock Lesnar has long been expected to be making his UFC return soon. The former UFC heavyweight champion hasn’t fought since UFC 200 in 2016. He defeated Mark Hunt via unanimous decision in the co-main event of the night. However, that win was later overturned to a No Contest. “The Beast” tested positive for a banned substance. After serving a suspension, Lesnar is now eligible to return to fighting action whenever he’d like. Last summer, Lesnar set up a future meeting with current UFC heavyweight champion Daniel Cormier. The pair engaged in a shoving match after Cormier’s title win in July. “Brock Lesnar is doing his thing with WWE. One of the things about Brock Lesnar is, when that guy is ready to fight, he is not shy. He will call me and he will let me know. To be honest with you, I’m hoping to hear from that guy this summer,” White said. What do you think about Lesnar returning to the UFC to fight heavyweight champion Daniel Cormier?